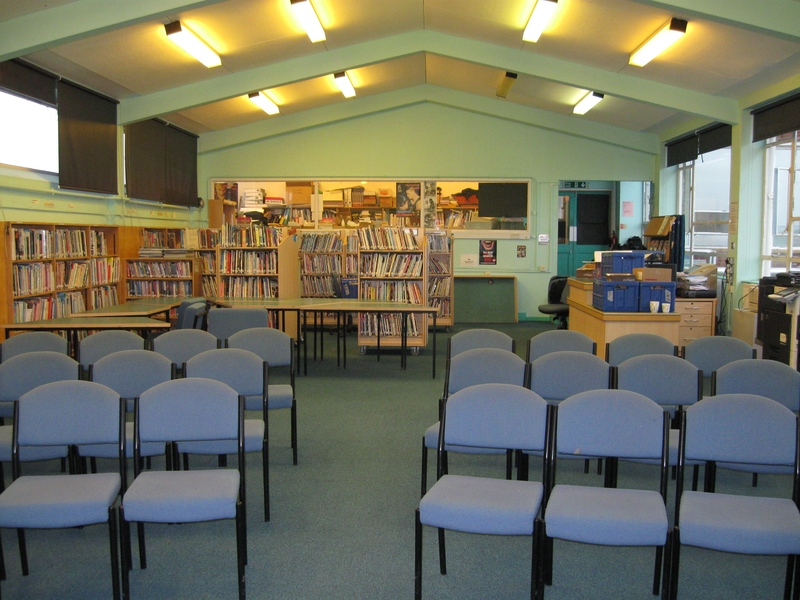 In August 2012 Emerson Park Academy was handed the task to transform one half of the schools library into a fully functional learning resource centre with 30 student PC locations and 1 teacher PC location. A pre-sales consultation meeting was arranged between Netcom and the School Head and IT manager. A site visit was booked for that same week. Emerson Park was looking for a company who could take care of the entire project including product supply, installation and design. Netcom visited the school to carry out a consultation meeting and to run through the schools project requirements. Netcom then began designing the ICT suite ensuring we did our up most to meet all the schools requirements. The first thing was to design a seating plan to accommodate the students and teacher within the space available. Netcom designed 2 different floor plans on our CAD software. Both designs included our secure ICT flip screen desks with full security features. Each workstation would have a made to measure PC enclosure situated under the desktop to secure the new PCs. The PC enclosures are designed to house the tower or desktop under the desk. Each enclosure has its own key lock ensuring the unit is completely secure. Netcom used double flip screen desks designed to seat two students per desk. We also included a teachers desk which had flip screen and all the security features plus a set of draws mounted on the under side of the desk top. Once we had confirmed the preferred floor plan we created a cabling plan for the Cat5e user outlets. Netcom would install 35 new data outlets situated around the room. We installed an outlet at each work station which was situated in our under desk cable containment. The 4 remaining outlets where placed for printers, scanners and laptops. These data outlets would be routed back to a brand new 15U data cabinet which was to be situated in the corner of the suite. The cabinet was supplied and installed by ourselves. The cables were routed round the classroom through perimeter dado trunking. This trunking prevents any tampering and also adds to the ascetics of the room. The new Cat5e outlets were terminated at the new cabinet within our patch panels. Netcom then patched all the new outlets into the relevant data switches which we provided and installed. To service these new outlets Netcom needed to provide a new wall mounted cabinets. This remote cabinet would then be linked back to main comms cabinet situated in the school via a fibre optic link. 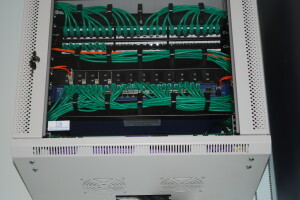 Netcom supplied a 15U wall mounted cabinet. 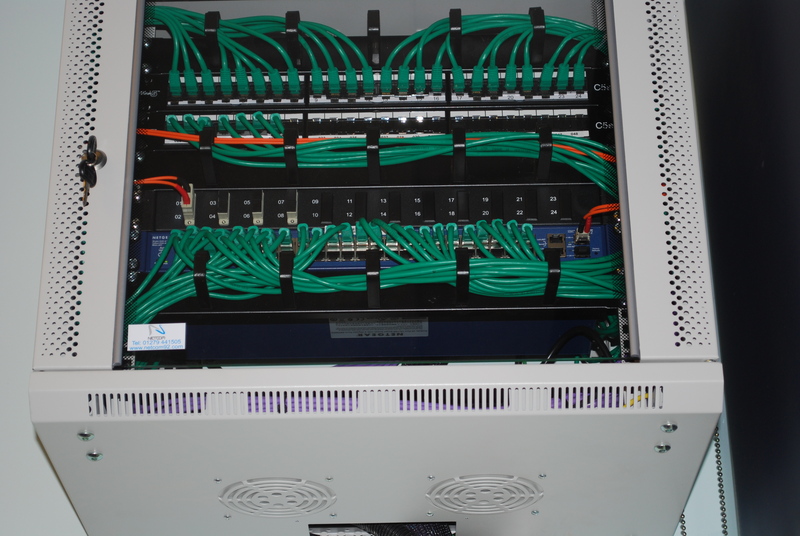 This cabinet was wall mounted at high level and housed our data patch panels and Netgear data switches. The switches were supplied and installed by ourselves and we carried out all the necessary patching to make these data outlets active. 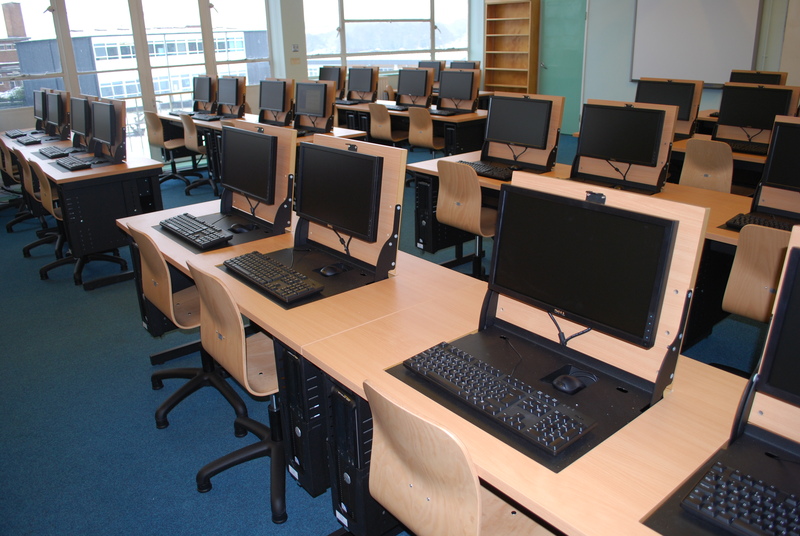 Netcom would be providing and installing 31 new PC’s for Emerson Park’s ICT suite. During our consultation meeting we discussed the specification the school required. The school opted for Dell optiplex machines. The machines would be installed incorporating the desk security features at each workspace. The monitors were mounted to the secure flip screen and the towers were situated in the PC enclosures mounted under the desktop. All the cables were connected to the data and power outlets within the under desk cable containment. Netcom then collected all the serial numbers and passed them to the school for asset tagging. Emerson Park wanted to offer ICT provisions to their pupils in every classroom. The school understands that the computers will not be used all the time like the computers in the main ICT suite which means wasted desk space when not in use. Netcom’s solution was to offer our flip screen secure desking. This is a desk which offers all the same security features as the desk they have in their ICT suite but it can also be used for non ICT use. The desk does this by having a gas operated strut which raises and lowers the monitor, keyboard and mouse. When lowered the monitor is hidden away in a recess housed in the desktop. This makes for a smooth and empty worktop for the students to carry on working. The desks are designed to seat two students and measure 1600mm wide x 600mm deep x 730mm high. The desks are to be arranged in a cluster of three directly under the new Cat5e data outlets. All the data and computer cables are routed through our under desk cable management system and connected back to the outlets on the wall. These desks can be made in any size and colour. Netcom have also included under desk power extension units. By using the power extension units the school can have four computers running from a single electrical socket. 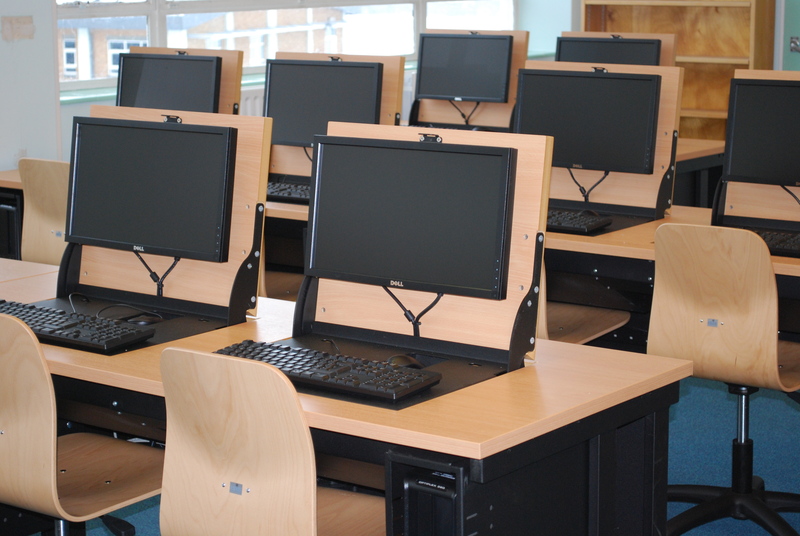 The school has double electrical sockets in each room so with these power units fitted the additional PC’s have not required any new electrical sockets which have resulted in a significant cost saving to the school.